There is still a significant amount of cleared land available that has yet to have anything built on it south of Beacon Hill Lane (25th Street). It appears the infrastructure is about to be rebuilt. I have seen surveyors doing work. 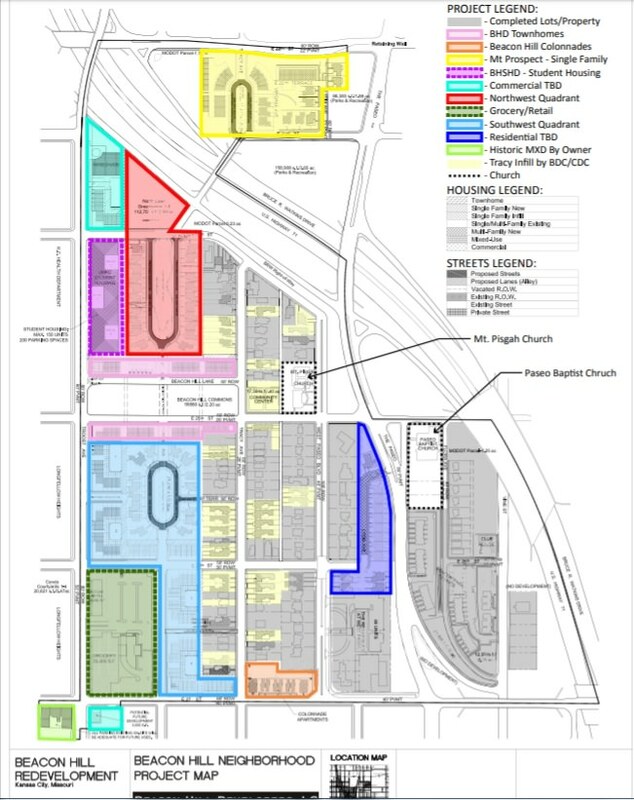 Here is the neighborhood plan. Click on this link to go to the PDF if you want to enlarge the map for detail. Last edited by FangKC on Sun Jul 15, 2018 11:46 pm, edited 2 times in total. I've made an update map showing the development status. After a more than two-year effort, work on a new 92-room LaQuinta Del Sol hotel got its formal start Tuesday, the latest addition to the growing Beacon Hill neighborhood in the southeast corner of greater downtown. The new hotel’s primary market will be serving visitors to the nearby Hospital Hill healthcare campus. The four-story building will include 2,000 square feet of retail space and should be ready for occupancy by June 2019. The hotel is not a typical canned design,” according to the release. “It was designed by Generator Studio to fit into the Beacon Hill neighborhood’s modern upscale feel. That actually does a good job of fitting the new home style as a concept. It's been a frustrating time to be an architecture snob. Seems like every project that gets announced has zero imagination put into it. Nothing to even say about it. The best we can hope for is not get many of the same style in a row (like the Cordish Light buildings, ugh). These 'lego block' buildings are pretty common now but somewhat tolerable if mixed about. The one above at least has some variable texture to it, others don't. Same goes for those 'container' buildings like near Armour/Main. OK if they are mixed about around town but when you have several in a row it starts to look like 'the projects'. Imagination, sure. But client vision and budget to program area - especially in a white-hot construction market - are also significant challenges to any project. From the outside it’s hard to tell what specific dynamics determined the outcome. Not making excuses, just pointing out that projects rarely work out so that architects get to do whatever they want. Believe me, I wish it were otherwise. It looks like they have been gearing up for this for a while. There have been some recent revisions to the Beacon Hill master plan for the section north of 71. Also, there is a new submittal on Compass for a multi-unit building at 2737 Forest. I don't see any renderings/plans or even number of units. It will be designed by B+A Architecture. 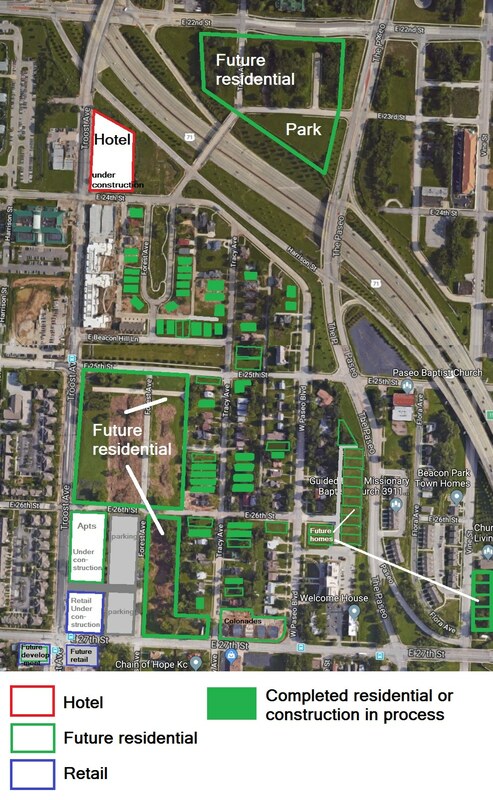 On the island north of 71, I have sort of dreamed that it might get a couple of high- to mid-rise apartment buildings instead of townhouses or single famiy houses. The views of downtown, and in all directions, would be nice there. Since it is uninhabited, now would be the time to zone for high-density buildings like that. You would get less pushback, i.e. neighbors complaining about the buildings blocking their view, sunlight, parking, etc. I like that idea but I’m curious if the market would support anything taller than 2-3 stories there. Probably not, but that would be a good place to build apartment towers. 1211 E. 24th Street is for sale. And people say we’re losing our affordable housing! Nice downtown view from couch.. He cited the East Patrol Station as a selling point. My goodness.